Sophie Turner has spoiled Game of Thrones Season 8 for a few people. The Sansa Stark actress admits that she is terrible at keeping secrets and is surprised when people tell her things that she's not supposed to share. Game of Thrones fans have been waiting over a year to see how everything is going to end, and the wait is almost over. However, if you're close friends with Turner, you can easily get a shortcut just by asking her. The endings of Game of Thrones, Avengers: Endgame, and Star Wars 9 are all huge secrets. HBO has gone out of their way to ensure that nothing gets out, just like the other properties listed. Scripts on difficult to read red paper, secret iPads, reading portions of a script in a locked room, and supervised readings are all some of the methods that studios utilize to make sure nothing is spoiled. 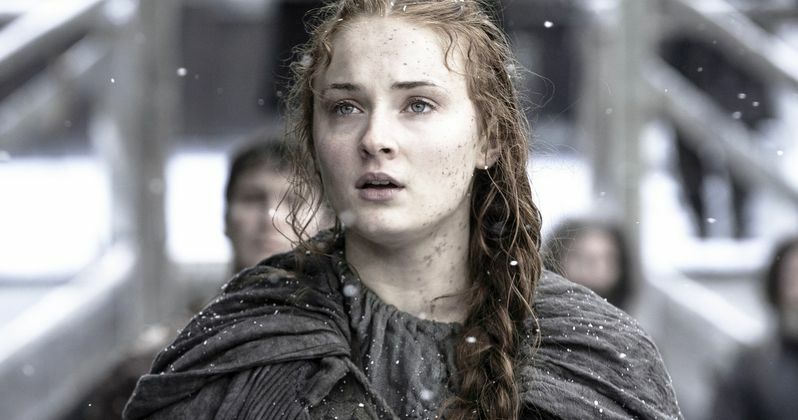 When asked if she's scared of keeping such a big secret, Sophie Turner says, "terrified." She explains. "I'm so bad at keeping secrets. I don't think people tell me things anymore because they know that I can't keep them. I've already told the ending of Game of Thrones to a few people." Ok, that doesn't seem like the kind of thing that you would want to mention in an interview. HBO more than likely knows that some cast and crew members might share some information, but to straight up announce to the world that you've told people the end of Game of Thrones season 8? That's pretty bold. Obviously, the interviewer asked if the actress was drunk when she spilled the beans. Sophie Turner had this to say. "Nope, sober. I was like, Hey, if you want to know, I'll tell you. But it's people that I know, not random people. It's people that I know will keep the secret." Can someone who is not good with telling secrets know how to spot someone who is able to? That's the real question. Regardless, this means that the Jonas Brothers for sure know how Game of Thrones season 8 ends, so if you know those dudes, you can probably get it out of them, just promise you won't tell anyone else. Sophie Turner and HBO will totally understand. Even for those of us who don't personally know the Jonas Brothers and Sophie Turner, our wait is nearly over. Game of Thrones season 8 debuts in April and we're all going to be treated to a cinematic-like experience which was not ruined by Sophie Turner or the Jonas Brothers. We can all watch it spoiler-free and get surprised with the rest of the world. Turner is lucky that the show is over because HBO could probably take some disciplinary actions against the actress for admitting such things in public. You can read the rest of the spoiler-free interview with Sophie Turner over at W Magazine.